prosit is here to help your business! There are reasons why I in general don't fancy fine dining. Imho the food is often more hyped, pretentious and pretty to look at than it is flavour and texture carousing, mind-blowingly enjoyable to eat. Not to mention over-priced. I'd rather go on a trip or get more shoes than pay a hefty price for a fine dining experience to be honest. My best, most awesome meals have so far been prepared and cooked by people skilled at seasoning using good produce. And for a reasonable price, often more than reasonable priced actually. That said, I think it could indeed be a delightful experience to have dinner at the pop-up restaurant Dill Sthlm hosted by British Michelin star chef Michael Wignall, The Latymer during a few weeks this autumn. I was lucky enough to be one of the eight chosen Yelpers to have dinner there this evening. The restaurant is situated in old industrial premises which have been lovely and simply done up in a both rough and romantic way creating a lovely ambiance. Huge windows overlooking a road with heavy traffic and the Saltsjöbanan train rails, two portaloos being the only facilities - which made for a rather interesting experience using them when the train ran by just behind your back. As well as putting one of the dampers on the evening, because you couldn't wash your hands with water and soap after using the facility. Neither nice nor classy. Greeted with champagne and a duet playing classical tunes, which was indeed a nice start to the evening we'd all been looking forward to a lot. Unfortunately though the food didn't at all live up to our expectations and neither did the service, with exceptions of course. The best memories I take with me from the evening is the great company of people that made me laugh a lot, the ambiance and the absurdity of a lot of things placed before us, during the 10 courses molecular gastronomy tasting menu (yes you could choose a vegetarian one!). Apart from what I thought of the dishes themselves, here are a few more negative impressions I have of the evening. Yes I do expect more from a restaurant claiming to be fancy. ~ The waiters really should ask whether you want the meat/fish menu or the vegetarian one, you as a guest shouldn't have to ask for it. ~ When you've established you do indeed want the vegetarian menu it shouldn't take three courses before the waiters remember that simple fact. ~ When you ask about the ingredients and their origin the waiters really should be able to answer and not only say 'the egg comes from a hen'. ~ The waiters should be attentive and refill your water glass regularly without you having to wave at them for some time. ~ Some of the waiters were really nice and friendly, some did have a bit of an attitude problem actually. ~ As someone neither interested in nor fond of alcohol I think dinner is best enjoyed with water as beverage, I do prefer ice water before carbonated water. It is a nice gesture to let the guest choose and not impose one of them only. And the quality of the carbonated water was not good, there was a stale tang. ~ And yes, as it turned out, having to pay a simply ridiculous price for a decanter of (not good) water, is just... simply ridiculous. ~ Also, paying good money for a hyped meal of this kind (and yes I am well aware of the fact that a meal at the 'real' restaurant would indeed cost much more, still cheap it was not) strange as may seem, it is indeed nice to leave the restaurant satisfied and pleasantly full. We did not. ~ The guests who paid for the wine package got quite a generous, recurrent serving of wine, which did feel a bit absurd given the size of the portions... Perhaps the idea was to fill the diners with plenty of alcohol so they wouldn't taste or be critical of the hyped food? ~ Also, both the price of the taste menu and the wine package had been bumped up, without advanced noticed. Apparently, it takes a lot more to charm me and my tastebuds completely than something hyped and Michelin-starred. A pleasant overall experience, Dill Sthlm, even if the food in general didn't at all live up to my expectations it was an eye-opening and fascinating evening on many other levels. EDIT 13.09.29 - Apparently the Dill Sthlm experience was a PR-coup by the rather infamous German discount supermarket-chain Lidl. They've hired the Michelin-chef to prepare food from their groceries, to make people see that you can prepare great food from their stock quality doesn't count. And once again some ridiculous PR-firm has made a mess of things, this is not the way to build customer relations and credability for a brand. Not to mention the reputation of the Michelin chef, if one had a wish to some day visit the Latymer that wish has certainly evaporated after this experience. I hope the money he was paid made up for a poor decision reputation-wise. It doesn't get better with, yet another, communication manager being quoted to say "This has never really been a secret, we would have told if anyone asked. But noone asked." Surprise, on the evening in question we DID ASK where the name Dill came from and the waiter told us "It's because it's the same simple word in both Swedish and English". Clearly they'd either deceived the staff too or instructed the staff with that answer in order to deceive the guests. Let's just say I'm very pleased I was not one of those who naively praised the hyped food. And that I (we) did pick up on several negative impressions during the evening. The only thing I buy at Lidl is kitty litter, will continue to do so. And somehow that is indeed a perfect symbol for what I think of Lidl and their business idea. And ridiculous PR-coups. Okay, am I to understand that you were invited to attend the dinner but still had to pay for it? Interesting concept in itself. Just judging from the photos I would be happier eating a real dinner not just taking part in a taste test. However, it does look like you had an entertaining evening with good company. Too salty is something I often think about restaurant dishes. Chefs insist that salt and fat give flavour - but I think it can be found in plenty of other ways. I am very glad that your experience was positive on balance though. Anledningen till att isvatten inte erbjuds är av den enkla anledningen att det varken finns is eller rinnande kallt vatten i lokalen. Mineralvattnet är gratis, det du hade på din nota var druvjuice, kaffe eller vin. hej madelene nilsson, vem du nu är - vi drack bara vatten, varken kaffe, vin eller druvjuice. det kolsyrade vattnet var mao INTE gratis, av notan framgår "öppen dryck á 110 kr". om du hade brytt dig om att lämna kontaktuppgifter hade jag kunnat skicka en verifierande kopia på kvittot. Hej Pia. Om ni bara drack vatten så har det blivit fel på er nota, vattnet kostar ingenting. Kontakta Dill så du kan få pengarna tillbaka. Jag skrev inget om dina andra negativa upplevelser, bara om just vattnet eftersom jag förstod att något blivit fel. Jag är ledsen att du tog så illa vid dig, det var absolut inte min tanke med kommentaren. Tråkigt att du säger på twitter att jag lämnat en sur kommentar för att du inte var nöjd med upplevelsen på dill..? jag upplevde din initiala kommentar som sur ja och saknade kontaktuppgifter. dock tyckte jag din andra kommentar var trevlig på alla sätt o vis, skulle precis skriva det när du lämnade en tredje... det står 'öppen dryck' på kvittot, vi var två vid bordet som ENBART drack vatten - vi vet väl ändå bäst själva exakt vad vi drack ändå? Want to hire me as a freelancer? Feel free to get in touch! A) I don't do sponsored posts. B) I don't welcome guest posts. This is a personal lifestyle blog with my texts and pictures only. So, thank you, but no thanks. Färska recensioner av Pia K T.
do you want spagetti or macaroni? 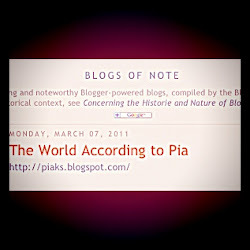 PLEASE NOTE TEXT AND PHOTOGRAPHS © THE WORLD ACCORDING TO PIA. ALL RIGHTS RESERVED, NO PART OF THIS BLOG MAY BE REPRODUCED AND/OR COPIED BY ANY MEANS WITHOUT CONSENT FROM AUTHOR.